Last week I introduced fault trees, giving a hint at what they’re good for, and showing some fault-tree diagram basics. Today I’ll focus on the mechanics of building one. 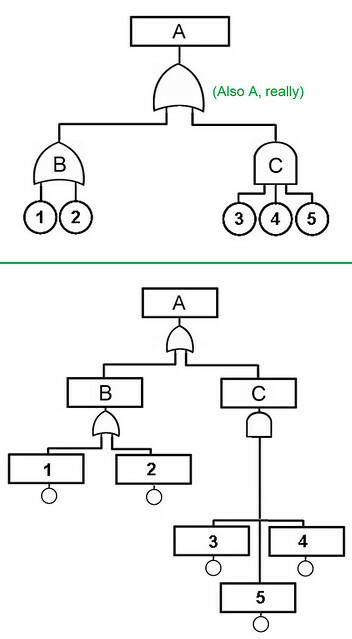 The image below, showing two different diagrams for the exact same logical fault tree, serves as a quick review. The top event, “A,” has two 2nd-level events, “B” and “C,” having two and three child events respectively. An OR gate is associated with the top event and event B, while an AND gate is associated with event C. Events 1 through 5 are basic events, which are initiators. They are literally “bottom events” though we don’t usually use that term. The difference between the top and bottom renderings below is just a matter of formatting. The bottom rendering looks much nicer in diagrams when we replace “A,” “B,” “2,” etc. with descriptive text. Here I’ll use whichever convention fits best on the page. It’s important to realize that in the bottom style, the logic gate goes with (sticks to) the event above it. Last time I mentioned that building a tree is a top-down process in the sense that you start with the top event of the tree. Since fault trees can have only one top event but a large number of bottom events (initiators), the analogy with living trees is weak. An organizational chart might be a closer analogy, but even that isn’t accurate, since fault trees can contain the same initiator events in multiple places. I’ll show how this can happen later. We typically get the top event of a tree from a hazard assessment where an unwanted outcome has been deemed critical – something like an aircraft hitting the end of a runway at speeds over 50 mph due to a brake system fault. From the top event, we identify its high-level contributors. In the case of the aircraft brakes example, the redundancy designed into the system may make descriptions of these conditions a bit wordy. For example, consider a dual-hydraulic-brake design with two systems, each feeding half the brakes, with eight brakes total. In that system, one equipment state causing the top event (there are several) would be complete loss of hydraulic system number 1 plus sufficient additional failures to render braking inadequate. Those additional failures could include, for example, the complete failure of hydraulic system number 2 OR mechanical failures of one or more of the system 2 brakes OR loss of the command signal to the system two brakes, and a few others. That is an example of one of the possible causes (i.e., one of the 2nd level events) of faults that could cause the loss of braking specified in the top event. There may be five or ten others, any of which could produce the hazardous state. The word “any” in the previous sentence tells you the relationship between the top event and this collection of second-level contributors. It is an OR relationship, since any one of them would be sufficient to cause the hazard. An OR gate is therefore tied directly to the top event. For the first 2nd-level intermediate event of the aircraft brake system example above, we would carefully come up with a name for this fault; we can refine it later. Something like “Loss of hydraulic system #1 plus additional failures” would be sufficient. Note that a good name for this event gives a clue about the logic gate associated with it. The word “plus” suggests that the gate for this event will be an AND gate. Without knowing anything else about the system and its operation at this point (details we would get from system schematics and operating manuals) we can’t really specify the gate associated with the first of the two events listed above. If hydraulic system #1 is itself redundant, it might be an AND gate, otherwise an OR. We can be infer that event #2 above has an OR gate beneath it, since several combinations of additional failures might be sufficient to render the whole system ineffective. Here’s a diagram for what we’ve modeled so far on the brake system failure. This diagram, of the bottom style in the above image, also includes small tags below each event description (above its gate) containing event IDs used by fault tree software. Ignore these for now. To help understand the style of thinking involved in modeling systems, whether physical, like a brake system, or or procedural, like complex surgery, compare what we’ve done so far, for aircraft brakes, with the brake system of your car. For modeling purposes, let’s ignore the parking brake for now. Your car’s brake system also contains some redundancy, but it’s limited. If it’s a simple hydraulic brake system (most cars are more complex), it has two cylinders, one powering the front two brakes and one powering the rear. Both of these have to be in a failed state, for you to be without brakes for hydraulic reasons. Notice I said “have to be in a failed state” and not “have to fail.” The likelihood of both failing independently during a trip is much lower than the probability that one failed some time ago without detection and one failed during the trip. Fault trees deal with both these cases, the latter involving a latent failure and a monitor with an indicator to report the otherwise latent failure. Of course, the monitor or the indicator might be in a failed state, again without your knowing it. Redundancy and monitors complicate things. We’ll get into that later. 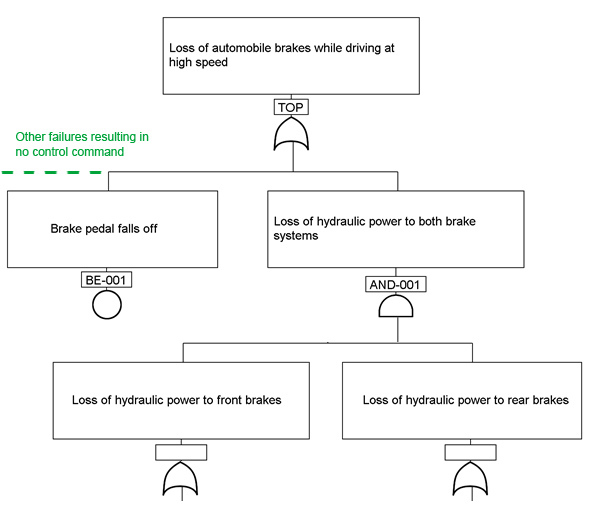 One thing immediately apparent in these two barely-begun fault trees, one for aircraft brakes, and one for car brakes, is that car brakes, as modeled, have a single-point failure leading to the top event, albeit an improbable one. The FAA guidance for design of aircraft systems specifies that no single failure regardless of probability should have catastrophic consequences. If we imagine a similar requirement for car design, we would have to add a brake subsystem with an independent actuator, like the separate hand or foot-controlled parking brake actuator in most cars. Have you tested yours lately? Next time we’ll explore the bottom events of fault trees, the initiator events, and the topic of exposure times and monitors. 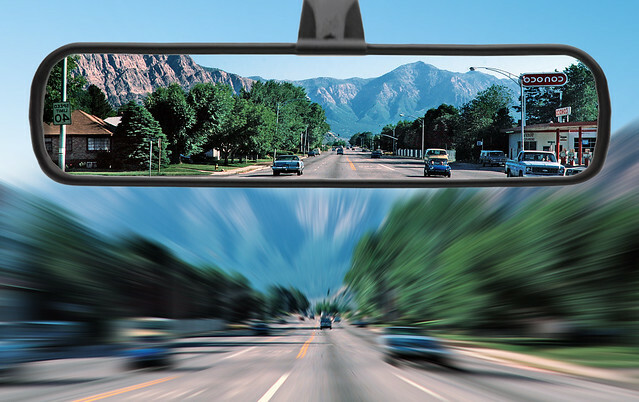 Working with these involves examination of failure probabilities and the time during which you’re exposed to failures, some of which – as with your parking brake – may be very long, dramatically increasing the probability that a latent failure has occurred, resulting in a loss of perceived redundancy. 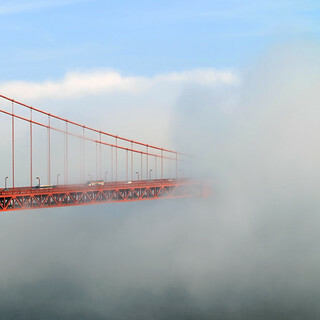 If you live near San Francisco, consider joining our new formed Risk Management meetup group. This meetup seeks to build community among risk professionals – internal auditors and practitioners, external consultants, job seekers, and students – by providing forums and events that showcase current trends, case studies, and best practices in our profession with a focus on practical application and advancing the state of the art. ECRI recently published their list of top ten health technology hazards for 2017. ECRI has released such a list each year since at least 2008. ECRI is no doubt aiming their publication at a broad audience. The wording of several of these, from the standpoint of hazard assessment, could be refined a bit to better inform mitigation plans. For example, the first item in the list (infusion errors) doesn’t really name an actual hazard (unwanted outcome). I take a crack at it below, along with a few comments on some of the other hazards. ECRI lists their criteria for inclusion in the list. They include – in system-safety terminology – severity, frequency, scope (ECRI: “breadth,” “insidiousness”), detectability (“insidiousness”), profile, preventability. That seems a good set of criteria, though profile might better point to an opportunity for public education rather than be a good criterion for ranking risks. We’d hope that subject matter experts would heavily discount public concern for imaginary hazards. This issue includes two unrelated problems, one simple and infrequent, the other common and often called “preventable human error.” Human error may be the immediate cause, but systems having a large number of critical, preventable errors are flawed systems. That means some combination of flawed hardware design and flawed operating procedures. The first problem, latent failure of ventilator alarm resulting in undetected breathing problem, caused several deaths in the last ten years. Failure of caregivers to respond to alarm reporting critical breathing condition is much more serious, and has been near the top of ECRI’s list for the past five years. In 2006 an Anesthesia Patient Safety Foundation conference set a vision that “no patient shall be harmed by opioid-induced respiratory depression” and considered various changes to patient monitoring. In 2011, lack of progress toward that goal led to another conference that looked at details of patient monitoring during anesthesia. Alert fatigue was again a major factor. Inclusion in ECRI’s 2016 list suggests HCI issues related to oximetry and ventilation-monitoring still warrant attention. Wouldn’t traditional radiation badges for the staff in hybrid facilities be a cheap solution? Yes Judy, EHR vendors’ versioning practices from the 80s do impact patient care. So do sluggish IT departments. ECRI cites delayed implementation of software updates with safety ramifications and data inaccessibility as consequences. Isn’t there some pretty low-hanging fruit for mitigation on this hazard list? Radiation badges, exhaust-fan filters on heater-cooler systems to catch aerosolized contaminants, and formal procedures for equipment cleaning that specify exactly what cleaning agents to use would seem to knock three items from the list with acceptable cost. Correcting issues with software deployment and version management may take years, given the inertia of vendors and IT organizations, and will require culture changes involving hospital C-suites. Despite decades of psychology studies showing that frequent and repetitive alarms (and excessive communication channels) negatively impact our ability to recall “known” information, to cause us to forget which process step we’re performing, and cause us to randomly shed tasks from a mental list, computer and hardware interface design still struggles with information chaos. Fixing this requires the sort of multidisciplinary/interdisciplinary analysis for which current educational and organizational silos aren’t prepared. We have work to do. ECRI deserves praise not only for researching and publishing this list, but for focusing primarily on hazards and secondarily on risk. From the perspective of system safety, risk management must start with hazard assessment. This point, obvious to those with a system safety background, is missed in many analyses and frameworks. Fault trees are back in style. This is good! I’ve taught classes on fault trees analysis (FTA) for just over 25 years now, usually limited to commercial and military aviation engineers, and niche, critical life-support areas like redundant, closed-circuit scuba devices. In recent years, pharmaceutical manufacture, oil refinement, and the increased affordability of complex devices and processes have made fault trees much more generally relevant. Fault trees are a good fit for certain ERM scenarios, and have deservedly caught the attention of some of the top thinkers in that domain. Covering FTA for a general audience won’t fit in a single blog post, so I’ll try doing a post each Friday on the topic. Happy Friday. A fault tree is a way to model a single, specific, unwanted state of a system using Boolean logic. Boolean logic is a type of algebra in which all equations reduce to the values true or false. The term “fault” stems from aerospace engineering, where fault refers to an unwanted state or failure of a system at a system level. Failure and fault are typically differentiated in engineering; many failures result in faults, but not all faults result from failures. A human may be in the loop. The last two bullets above are certainly correct, but don’t really drive the point home. Fault tree analysis during preliminary design of complex systems is really the sole means to rationally allocate redundancy in a system and to identify the locations and characteristics of monitors essential to redundant systems. Optimizing the weight of structural components in a system is a fairly straightforward process. For example, if all links in a chain don’t have the same tensile strength, the design wastes weight and cost. Similarly, but less obviously, if the relationships between the reliability of redundant system components is arbitrary, the design wastes weight and cost. Balancing the reliability of redundant-system components greatly exceeds the cognizing capacity of any human without using FTA or something similar. And the same goes for knowing where to put monitors (gauges, indicators, alarms, check-lists, batch process QC steps, etc.). A fault tree has exactly one top event and a number of bottom events, usually called basic events or initiators. I’ll use the term initiator to avoid an ambiguity that will surface later. Initiator events typically come from failure mode effect analyses (FMEA). To calculate a probability value for the top event, all initiators must have an associated probability value. That probability value often comes from a known failure rate (a frequency) and a know exposure time, the time duration in which the failure could occur. Fault trees are useful even without probability calculations for reasons described below. Fault trees are constructed – in terms of human logic – from top to bottom. This involves many intermediate fault states, often called intermediate events. The top event and all intermediate events have an associated logic gate, a symbolic representation of the logical relationship between the event and those leading upward into it. We often mix metaphors, calling the events leading up into an intermediate event and its associated logic gate child events, as would be the case in a family tree. The solution to a fault tree is a set of combinations of individual failures, errors or events, each of which is logically sufficient to produce the top event. Each such combination is known as a cut set. Boolean logic reduces the tree into one or more cut sets, each having one or more initiator (bottom level) events. The collection of cut sets immediately identifies single-point critical failures and tells much about system vulnerabilities. If the initiator events have quantified probabilities, then the cut sets do to, and we can then know the probability of the top event. For an example of cut sets, consider the following oversimplified fault tree. 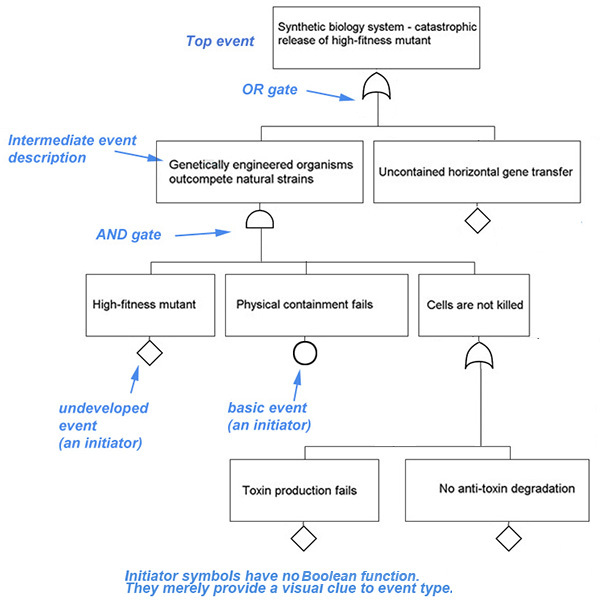 As diagrammed below, it has three cut sets, two having three initiator events, and one having only one initiator (“uncontained horizontal gene transfer). If the reason for this cut-set solution isn’t obvious, don’t worry, we’ll get to the relevant Boolean algebra later. A common rendering of a fault tree is through a fault tree diagram looking something like the one above. In the old days fault trees and fault tree diagrams could be considered the same thing. Diagrams were useful for seeing the relationships between branches and the way they contributed to the top event. Fault tree diagrams for complex systems can exceed the space available even on poster-sized paper, having hundreds or thousands of events and millions of cut sets. Breaking fault tree diagrams into smaller chunks reduces their value in seeing important relationships. Fault trees must be logically coherent. We now rely on software to validate the logical structure of a fault tree, rather than by visual inspection of a fault tree diagram. Software also allows us to visually navigate around a tree more easily that flipping through printed pages, each showing a segment of a tree. Fault tree diagrams represent logical relationships between child and parent events with symbols (logic gates) indicating the relevant Boolean function. These are usually AND or OR relationships, but can include other logical relationships (more on which later). Note that symbols for logic gates other than AND and OR vary across industries. Also note that we typically supply initiators with symbols also (diamonds and circles above), just as visual clues. They serve no Boolean function but show that the event has no children and is therefore an initiator, one of several varieties. Fault tree analysis is a form of probabilistic risk analysis. If you understand “probabilistic” to require numerical probability values, then FTA is only a form of probabilistic risk analysis if all the fault tree initiators’ probabilities are known or are calculable (a quantitative rather than qualitative tree). To avoid confusion, note that in many circles, the term “probabilistic risk analysis” and the acronym PRA are used only to describe methods of inference from subjective probability judgments and usually Bayesian belief systems, as promoted by George Apostolakis of UCLA in the 80s and 90s. This is not fault tree analysis, but there is some overlap. For example, NASA’s guide Bayesian Inference for NASA Probabilistic Risk and Reliability Analysis shows how to use PRA (in the Bayesian-inference sense) to populate a fault tree’s initiator events with progressively updated subjective probability values. Wikipedia’s entry on fault tree analysis starts with the claim that it is a “deductive failure analysis.” Setting aside the above-mentioned difference between faults and failures, there’s the matter of what makes an analysis deductive. I’m pretty sure this claim (and the claim that FMEAs are inductive) originated with Bill Vesely at NASA in the 1980s. Bill’s a very sharp guy who greatly advanced the state of fault tree art; but fault trees are not deductive in any way that a mathematician or philosopher uses that term. Deduction is reaching a conclusion about an instance based on an assumption, premise, or postulate about the population containing that instance. Example: if all men are mortal and Socrates is a man, then Socrates is mortal. This is deduction. It uses a statement in universal-conditional form (“if all A is B”) and a fact about the world (“observed X is an A”). Induction, technically speaking, is the belief or assumption that unobserved cases will resemble observed cases. This is the basis for science, where we expect, all other things being equal, that the future will resemble the past. Fault tree analysis relies equally on both these forms of reasoning, assuming, for sake or argument, that induction is reasoning, a matter famously contested by David Hume. The reduction of a fault tree into its cut sets includes deductions using the postulates of Boolean algebra (more on which soon). The rest of the analysis relies on the assumption that future failures (initiator events) will resemble past ones in their frequency (a probability distribution) and that these frequencies can be measured as facts about the world. Initiator probabilities derived from Bayesian inferences involve yet another form of reasoning – diachronic probabilistic coherence (more on which maybe someday). In any case, past students of mine have gotten hung up on whether fault trees and FMEAs are deductive and inductive. This pursuit, which either decays into semantics or falls down a philosophical pit, adds nothing to understanding fault trees or their solutions. One final piece of philosophical baggage to discard stems from the matter of the explanatory power of fault trees. Fault trees’ concern with causes is limited. They don’t care much about “why” in the deep sense of the term. Despite reliance on logic, they are empiricist in nature. 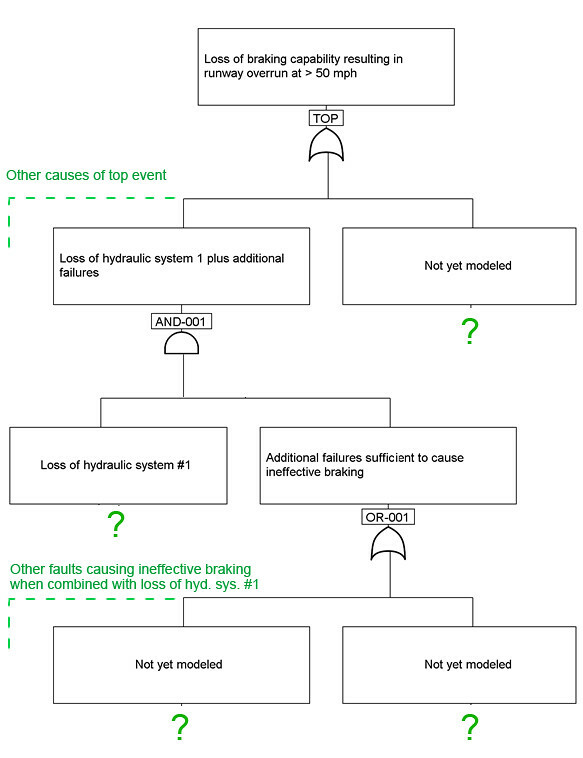 Fault trees explain by showing “how” the top event can happen, not “why” it will or did happen. 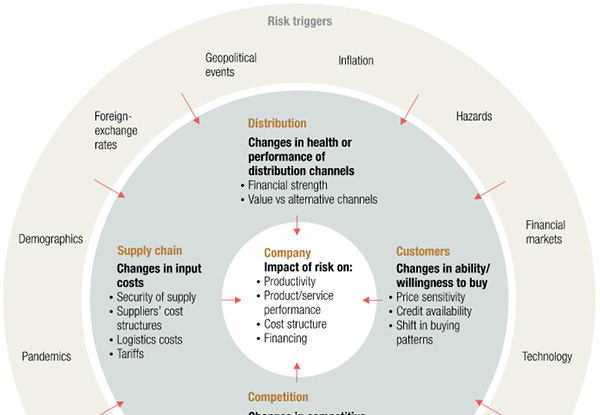 The fields of risk assessment, risk analysis, and risk management have each evolved nearly independently in a number of industries. This Meetup group aims to cross-pollinate, compare and contrast the methods and concepts of diverse areas of risk including enterprise risk management (ERM), project risk, safety, reliability, aerospace and nuclear, financial and credit risk, market, data and reputation risk, cyber risk, etc. Outside of aerospace and military projects, I see a lot of frustration about failures of failure mode effects analyses (FMEA) to predict system-level or enterprise-level problems. This often stems from the fact that FMEAs see a system or process as a bunch of parts or steps. The FMEA works by asking what happens if I break this part right here or that process step over there. For this approach to predict high-level (system-sized) failures, many FMEAs would need to be performed to exhaustive detail. They would also need to predict propagation of failures (or errors) through a system, identifying consequences on the function of the system containing them. Since FMEAs focus on single-event system failure initiators, examining combinations of failures is unwieldy. In redundant equipment or processes, this need can be far beyond the limits of our cognitive capability. In an aircraft brake system, for example, there may be hundreds of thousands of combinations of failures that lead to hazardous loss of braking. Also, by focusing on single-event conditions, only external and environmental contributors to system problems that directly cause component failures get analyzed. Finally, FMEAs often fail to catch human error that doesn’t directly result in equipment failure. Consequently, we often call on FMEAs to do a job better suited for a functional hazard assessments (FHA). 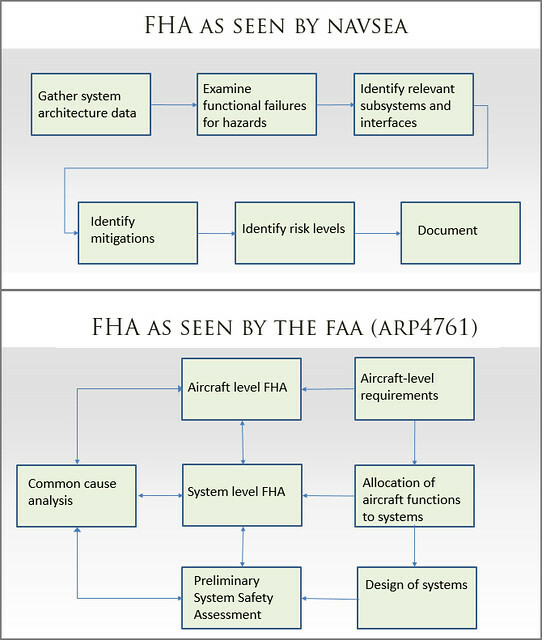 FHAs identify system-level functional failures, hazards, or other unwanted system-level consequences of major malfunction or non-function. With that, we can build a plan to eliminate, mitigate or transfer the associated risks by changing the design, deciding against the project, adding controls and monitors, adding maintenance requirements, defining operational windows, buying insurance, narrowing contract language, or making regulatory appeals. While some people call the FMEA a bottom-up approach, the FHA might be called a top-down approach. More accurately, it is a top-only approach, in the sense that it identifies top-level hazards to a system, process, or enterprise, independent of the system’s specific implementation details. It is also top-only in the sense that FHAs produce the top events of fault trees. Terminology: In some domains – many ERM frameworks for example – the term “hazard” is restricted to risks stemming from environmental effects, war, and terrorism. This results in differentiating “hazard risks” from market, credit, or human capital risks, and much unproductive taxonomic/ontological hairsplitting. In some fields, business impact analysis (BIA) serves much the same purpose as FHA. While often correctly differentiated from risk analysis (understood to inform risk analyses), implementation details of BIA varies greatly. Particularly in tech circles, BIA impact is defined for levels lower than actual impact on business. That is, its meaning drifts into something like a specialized FMEA. For these reasons, I’ll use only the term “FHA,” where “hazard” means any critical unwanted outcome. To be most useful, functional hazards should be defined precisely, so they can contribute to quantification of risk. That is, in the aircraft example above, loss of braking itself is not a useful hazard definition. Brake failure at the gate isn’t dangerous. Useful hazard definition would be something like reduction in aircraft braking resulting in loss of aircraft or loss of life. That constraint would allow engineers to model the system failure condition as something like loss of braking resulting in departing the end of a runway at speeds in excess of 50 miles per hour. Here, 50 mph might be a conservative engineering judgement of a runway departure speed that would cause a fatality or irreparable fuselage damage. Organizations vary considerably in the ways they view the FHA process; but their objectives are remarkably consistent. Diagrams for processes as envisioned by NAVSEA and the FAA (and EASA in Europe) appear below. The asterisk on prioritization of risks means that, in many cases, this isn’t really possible at the time of an FHA, at least in its first round. A useful definition of risk involves a hazard, its severity, and its probability. The latter, in any nontrivial system or operation, cannot be quantified – often even roughly – at the time of FHA. 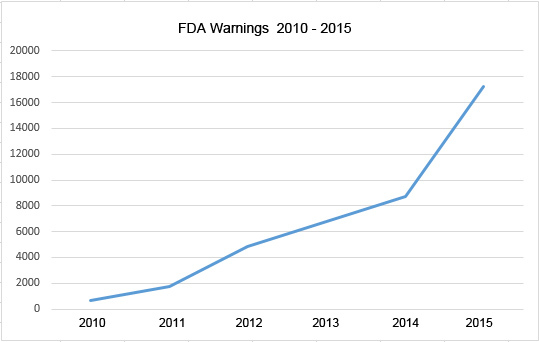 Thus the FHA identifies the hazards needing probabilistic quantification. The FAA and NAVSEA (examples used above) do not quantify risk as an arithmetic product of probability and severity (contrary to the beliefs of many who cite these domains as exemplars); but the two-dimensional (vector) risk values they use still require quantification of probability. I’ll drill into details of that issue and discuss real-world use of FHAs in future posts. If you’d like a copy of my FHA slides from a recent presentation at Stone Aerospace, email me or contact me via the About link on this site. 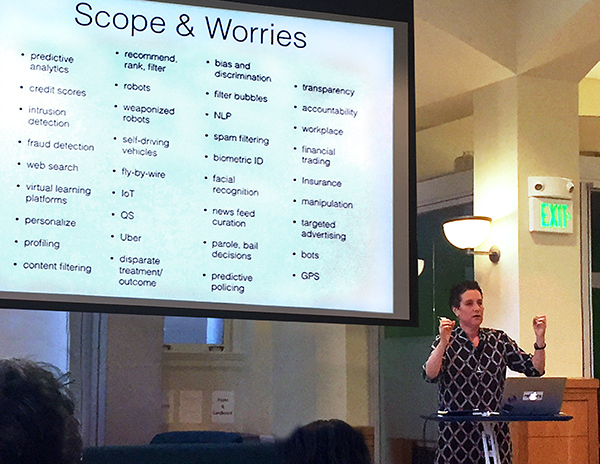 I keep slide detail fairly low, so be sure to read the speaker’s notes.